June-bearers are the most popular. Most of the commercially available cultivars are of this type. They produce a very large crop of very large fruits over the course of two to three weeks. There may be a few stragglers here and there, but they typically put out a big harvest and then stop. These are the berries you buy in the store. Everbearers typically produce smaller berries than do the June-bearing types of strawberry plants, but they produce a main crop at the beginning of the season and again at the end of the growing season. Overall, however, they will produce a smaller overall yield, on average, than the aforementioned June-bearers. 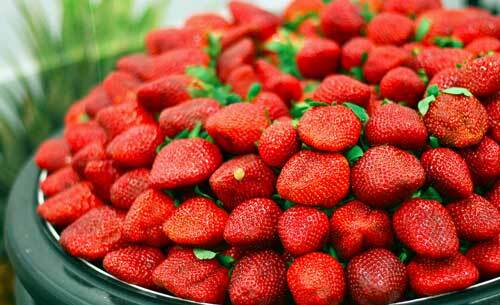 Day-neutral strawberries produce small fruits continually throughout the growing season. The major benefit of these plants is the fact that you can walk out to your patch on any given day and find a few ripe strawberries ready to be picked. However, the major drawback is that there won’t be a whole lot of them. While day-neutrals are typically chosen by indoor hydroponic strawberry growing operations, you will end up with a noticeably smaller yield than June-bearers, and significantly less overall harvest than the everbearers as well. If you aren’t specifically choosing this third type for a predetermined reason, go with one of the other two. Once you have landed on which type of strawberry plant you want to grow, you can either buy some plants from a local nursery or order them online. The varieties offered by your local nursery will likely be well-suited for your area. If you choose the ease and convenience of having them arrive at your door by ordering online, you can choose your variety and price shop for the best deals quickly and easily in this directory. If you need help choosing a suitable variety for your location, you can find your state and choose an appropriate variety from this list. How Many Strawberry Plants Do You Need? As a bare minimum, 6 or 7 plants are needed to provide an individual with enough strawberries to make the effort of planting and cultivation worthwhile. A family of 5 should look to procure between 30 and 35 plants in order to enjoy a sufficient quantity of fresh fruit. And, if you are planning on canning or making strawberry jam or other preserves, doubling the number of plants to 60 or more is necessary. Strawberries are remarkably resilient. They can survive in many spots you wouldn’t think possible. To get the best results, though, there are some basics you should know. 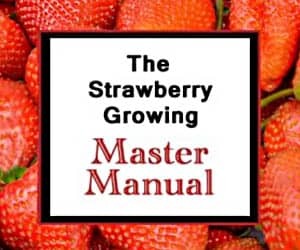 Now, on to the secrets of growing organic strawberries! The 4 Secrets to Growing Loads of Organic Strawberries! Strawberry plants have a higher relative nitrogen demand in the early spring and late fall. In early spring the plants are going through a highly energy-demanding period as they produce their strawberries and put out strawberry runners. Even if the runners are removed (see below! ), nitrogen can run low quite quickly in organic strawberry beds. Using conventional methods, chemical fertilizers with nitrogen, phosphorus, and potassium are easily added to buoy the needed nutrients and keep the berries coming. But, for the devotee of organic methods using the NPK chemical fertilizers is not an option. So, the first secret to growing loads of organic strawberries is to successfully keep nitrogen levels up in your berry planting. To maintain productivity and nitrogen levels, you’ll need to use organic fertilizers. Blood meal is a good option as it has 13% nitrogen. Other organic sources of nitrogen include fish meal, soy meal, and alfalfa meal. Feather meal is also a good source of nitrogen at 15%, but has very slow release rates. Aged manure is also a good source of nitrogen, but you have to be careful to not supply too much nitrogen to your strawberries as that can cause excess vegetative producti0n and fewer berries. Too much nitrogen can kill/burn up strawberries, however, so do not put raw, fresh chicken manure on strawberries (or any other extremely nitrogen-rich material). Organic farmers typically tremble when they hear the name of agriculture giant Monsanto: either with fear or anger or both. So, naturally (pun intended! ), herbicides such as Roundup are anathema to those wishing to do things organically. Skipping out on those weed poisons ensures that the produce you pluck will be pure and free from potentially harmful molecules when you consume them. But, that means the weeds will sprout and mock you mercilessly. The second secret of a prolific organic strawberry garden is to develop a habit of diligence when it comes to pulling weeds. Hand-pulling is the first resort of most non-chemical growers. Developing a schedule and sticking to it is important in the fight against unwanted growth. Shallow cultivation can also be successfully utilized. But, without chemical herbicides, if you want to haul in loads of fruit come harvest, it is absolutely essential that you keep on top of the weeds. There is an organic herbicide labeled for use with growing strawberries called GreenMatch Ex, but its use alone will not be sufficient to completely control the weeds. So, get your gardening gloves ready to go and pluck those weeds as soon as they show their ugly little heads. Just as weeds are a particularly painful problem in organic strawberry beds, pests and pathogens can be particularly prickly as well. There is an abundance of potent poisons available to send such scourges to purgatory, but who wants to eat those residues? The secret to maintaining organic integrity while harvesting a healthy hoard is three-fold. Plant only disease-free, healthy plants in soils with good drainage and air circulation. Keep your plantings away from areas that may harbor large populations of mites or microbes detrimental to your strawberries. 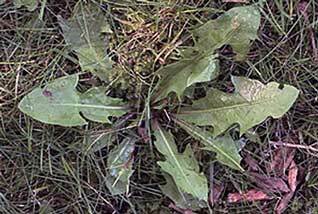 Managing weeds is also important as they can provide habitat for and harbor problem organisms as well. Mulching heavily underneath the leaves of your plants is also important. Soil, by its very nature, is home to legions of microbes. In many strawberry plantings, rain droplets splashing into dirt and thereby sending droplets of pathogen-infected wet mud up onto the vegetative components are the cause of disease and death. A heavy layer of mulch avoids this common problem. Fungi species and many parasites find happy homes in the dead or decaying leaves that fall from strawberry plants over the course of their lives. Being vigilant to remove any dead or decaying plant matter from your beds will help minimize problems. While virtually impossible to completely eradicate even with conventional methods, strawberry pathogens can also be deterred by the use of diatomaceous earth. 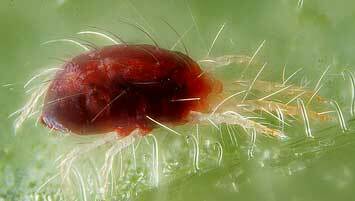 Frequent applications can reduce mite and other arthropod numbers by creating an inhospitable environment. Biopesticides like Serenade are also available, but are insufficient to eradicate pests as well. Managing them, however, is a critical secret for success. Protecting your garden is also quite important. The primary way of protecting against the microscopic predators is through variety selection. If you live in a region that is wetter then most, be sure to select a variety that has at least some resistance to powdery mildew and other wet-loving fungi. Don’t over-fertilize with nitrogen as many pests will be attracted to all the succulent tissues that come with too much nitrogen. And, of course, keep the fruit off the ground by mulching well and picking the fruit as soon as it is ripe. Remove any rotting fruit immediately! Bird netting or fencing of some sort is also a good idea to keep out the bigger pests like squirrels, birds, and rabbits. This last secret is a general secret for all types of strawberry growing, not necessarily just organic growers. But, with the added difficulties of foregoing the powerful conventional chemicals, it is even more vital for the organic grower. Simply put, you have to remove the runners. As you weed your garden regularly, keep a keen eye out for your plants’ attempts to clone themselves. When they put out runners, use your fingernails, scissors, or pruning shears to snip off the runners as soon as they can be identified. Strawberry plants will spend themselves in their reproductive efforts. It is critical to guide your plants in the way you want them to be productive. Some strawberry plants will produce dozens of cloned daughter plants if left to themselves. All of those runners means energy is diverted away from producing strawberries, which is why you planted them in the first place! So, be sure to watch for the production of strawberry runners and sever them as soon as possible. The plants will respond by devoting more productive energy to developing those loads of organic strawberries I promised! There are some good reasons to let a few runners develop as well, however. For more on that, be sure to read up on strawberry runners. Enjoy the fruits of your labor, and good luck! I’ve fed them with alfalfa from the start, mulched with lake reeds. Watered well. We had an extremely long winter this year in Alberta, Canada. The plants were mulched with straw and huge amounts of falling snow. They didn’t get frosted early! I’m wondering if I have a Boron deficiency? I have about 20 plants in a well drained 15×10 foot bed. Can you help me Mr S ? I am trying to decide whether to grow strawberries conventionally or organically in the NC piedmont region. How do you deal with botrytis and anthracnose organically? Also, what is the best amendment to add to clay soil? I know my pH must be adjusted with lime, but would like to know what you recommend otherwise. I see your nitrogen recommendations, but how do you know how much to add? Do you need to take soil samples regularly? I will be starting with a 1/2 acre of strawberries and would like to build on that. But do know that I will need to rotate fields to avoid some fungal issues. Is there a publication that helps organic strawberry growers on a larger scale? I have beeen having really bad luck with fungus gnats and their larvae with my strawberry plant. Ive lost 2 so far. My hopes were too grow organic pesticide free strawberries. How can i get rid of these pests? So far i have tried neem oil, and mixing hydrogen peroxide in the water i use to water them. I’d recommend trying a liberal application of diatomaceous earth. Good luck! I live in zone 8. What plants could I plant near my strawberries to help with insect control? You might want to apply a liberal amount of diatomaceous earth. It can help with insects, won’t harm your plants, and is organic! Good luck! I would like to grown my organic strawberries in a container. Is that feasible and what do I need to us in order to do so? thanks! Yes, you can do that. You just need to give them extra care. I’d recommend reading this first. Good luck! It looks like a whole new plant is growing next to a strawberry plant I planted last year…is this considered a runner? If so, is it best to have many plants without runners than have a few plants with runners for max fruit production? Most varieties will produce runners. If you have a new plant next to the old one, it is most likely a runner. If you are going for a matted row, you should let several root and then transplant appropriately each year. If you let all the runners root, they will choke each other out and you will end up with less strawberries. Good luck! Can I use NPK (20-20-20) for strawberry & what will be the ratio and interval? PLEASE HELP. Yes, you can, but they won’t be organic if you do. 10-10-10 is a much more commonly used conventional fertilizer for strawberries. I’d recommend you read this for more information. Good luck! can cow manure be use or does it have to be chicken manure? Yes, you can used aged cow manure as well. Good luck! Soil testing just revealed Nitrogen deficiency (we live in Zone 4–first hard frost yesterday.) I know that adding too much Nitrogen after renovation can cause all leaves and no fruit. Is Nitrogen deficiency a different situation? Should I add Nitrogen now before the snow settles in? Thank you. If you have nitrogen deficiency, it is a good idea to go ahead and amend the soil to increase the nitrogen levels prior to the spring fruiting season. Good luck! It actually is a bit difficult to get organic strawberry plants. However, once you get the plants, you can grow them using organic techniques and have healthy, pesticide-free strawberries to eat! Good luck! I bought 4 plants and now enjoying to transplant the runners, my question is when is the best time to cut it from the mother plant. Tnx so much. You can snip the runner any time after the daughter plant’s roots are established and drawing nourishment for the new plant. When that is in place, snip away and move wherever you’d like! Good luck! Can the June bearing and ever bearing strawberries be planted in the same bed? Or will they cross pollinate until they end up being all the same? They can be planted in the same bed. Cross-pollination actually helps strawberries grow bigger! Good luck! Yes, it should do ok as long as you don’t apply too much. Good luck! hello Mr.strawberry. my strawberry is going to die after i put some chicken manure on its soil as fertilizer. chicken manure is full of nitrogen, potassium and phosphorous and really matches strawberry but as it seems it does not work. do you have any opinion. thank you! Fresh chicken manure is too potent for most plants. It will burn them up and cause them to die. Chicken manure really needs to be aged for at least 6 months prior to using as a fertilizer for strawberries. Good luck! I have my plants in a kiddie pool. Their not that tall(bout as tall as the petals on my pinwheels). How heavy should the mulch be underneath? Inch or 2? Or thin single layer? You can layer a fairly thick application of mulch as long as it isn’t on the small plants. The mulch serves to keep the weeds down and provide a cleaner landing spot for ripe strawberries. Good luck! Hi, what kind of mulch do you recommend for strawberries. I grow mine in large flower containers. Any container that drains adequately will do. Strawberries can grow just about anywhere, so you can use flower pots, specialized strawberry towers, or just about anything else you can scrap together! Good luck! What do you consider aged chicken manure? 1 year, 6 months? I have some that from last summer. I live in zone 4. 6 months should be sufficient. A year is fine. Good luck! Is it actually that bad for us if I buy a plant that isn’t specified “organically grown”? I would think as long as you can abstain from using pesticides when growing at home, one is not getting any additional chemicals, plus the organic ones we buy are still sprayed with copper so they hold up longer until sale…these plants are a challenge to grow organically! It depends on who you ask! My own opinion is that non-organically produced plants will produce healthy fruit if grown organically before the flowers set fruit. Good luck! Do you have to start with an organic strawberry variety in order to grow organic strawberries. Or can you start with an ordinary plant and raise it in an organic manner and still get the same result. Thanks! There is some debate about that. In the purest since, the plant starts you purchase, either dormant or plugs, would need to be grown organically for the end product to be considered organic (and most are not). However, technically, as long as you are certified as an organic operation, you can (and most people do) label your end-product strawberries as organic as long as organic methods are followed. Good luck! Where can I buy organic strawberry plants for growing in GA? What is the type of fertilizer used for new growing strawberry? What is dose to used! The fertilizers are the ones listed in 1. 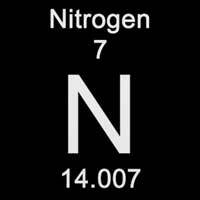 Manage the Nitrogen in the post above. The dose will be listed on the package. Good luck! I think I put too much fertilizer on my berries this spring. Composted chicken manure, bone meal and blood meal–the leaves were still chlorotic, so I put on some organic fertilizer for acid loving plants. Now I read it was a bad idea to fertilize at all in the spring and probably the reason I have no berries yet this year. Is there anything I can do but wait? The plants have been blooming for a couple of months, but most of the flowers just dry up and I’m really missing those first spring berries. Unfortunately, you will probably have to wait. See this page for more help, and this one for other possibilities of why your plants aren’t producing. Good luck! Thank you. Now I know why it’s important to keep up on removing the runners. No problem! Glad you’ve benefited, and good luck!